To update or change settings, first, log into Rezku POS. 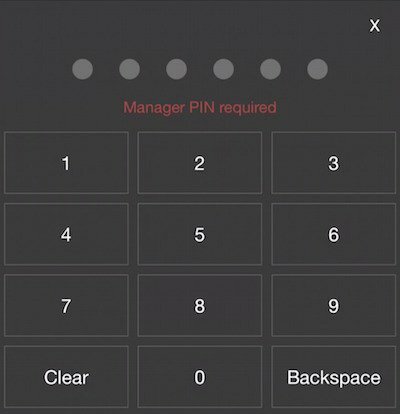 The default permissions require a manager’s PIN to authorize access. This is what the Rezku POS Settings screen looks like. 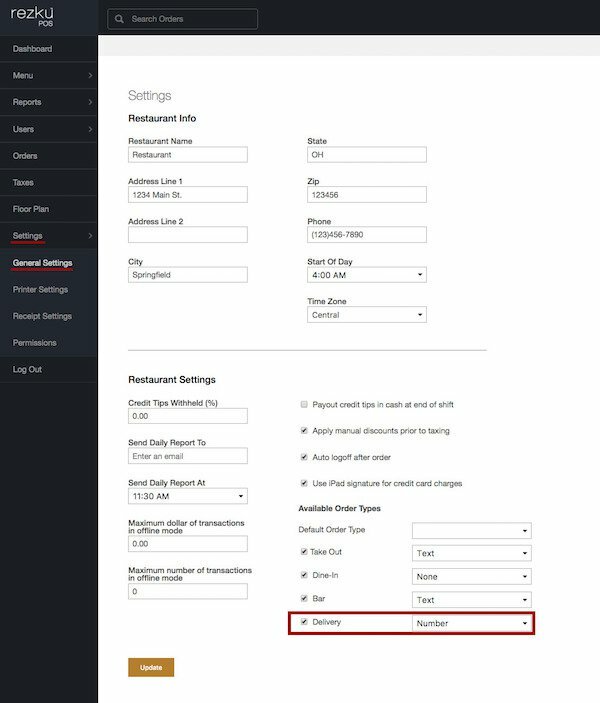 Once you have opened Rezku POS Settings, you’ll find useful information including app version, management and configuration options. The connections bar quickly tells you what connections are enabled using red and green indicators. Internet - This indicator tells you if the iPad’s networking is working. If you are using Wi-Fi, make sure it is turned on in the iPad Settings. If you are using a wired connection for your iPad, make sure everything is plugged in and configured properly. Card Reader - This indicator tells you if there is a card reader attached to the register. To add a card reader, tap on Configure Card Reader. Printer - This indicator tells you if the Cash Drawer Printer (receipt printer) has been set up. To add a receipt printer or chit printer, tap Configure Printers. 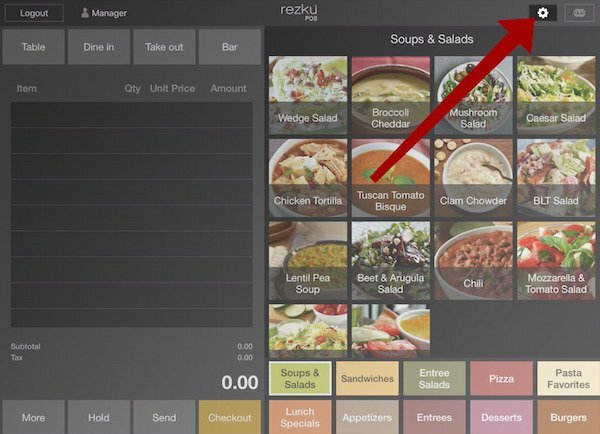 Refresh Settings - Changes made to settings in Back Office are automatically applied to your Rezku POS tablets. However it may take a few minutes before changes appear. If you want to update your tablet immediately, tap the Refresh Settings button. Animations - Animations can be enabled for Rezku POS. Animations do not affect the functionality of Rezku POS but may slow down older iPads. By default, the animations are disabled. Cash Drawer - Complete information about Cash Drawer management is found in the Cash Drawer Management document, available from Guest Innovations. Print End of Day Report - Uses the Cash Register Printer to print out totals for the restaurant including sales and charges. View Dashboard - Similar to Dashboard view in Back Office. The most important data for understanding your restaurant’s sales volume, right at your fingertips. Auto Numbering - With Auto Numbering enabled, you choose a range for order numbers to automatically generate. Order numbers are set per-register, so one method to use is setting a range that corresponds to the register number, such as 100-199 for Register One, 200-299 for Register Two, and so on. Auto Numbering works in conjunction with the order types configured in Back Office. To get to these settings, go to General Settings, under Available Order Types. Change the drop-down box next to the different order types to Number, to enable order numbering. Default Screen After Login - After the user logs into the app or completes an order, you can choose which screen in Rezku POS appears. New Order - The main screen, used for taking orders. Order List - This view shows you all tickets and their status in a list-view. 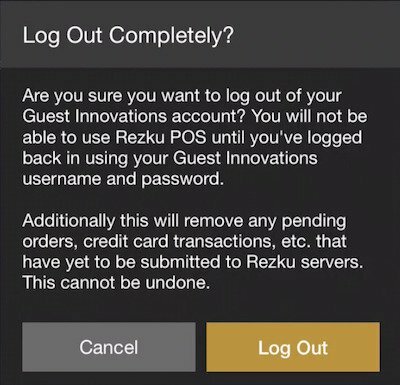 Log Out - Remove your Guest Innovations account from the Rezku POS app. 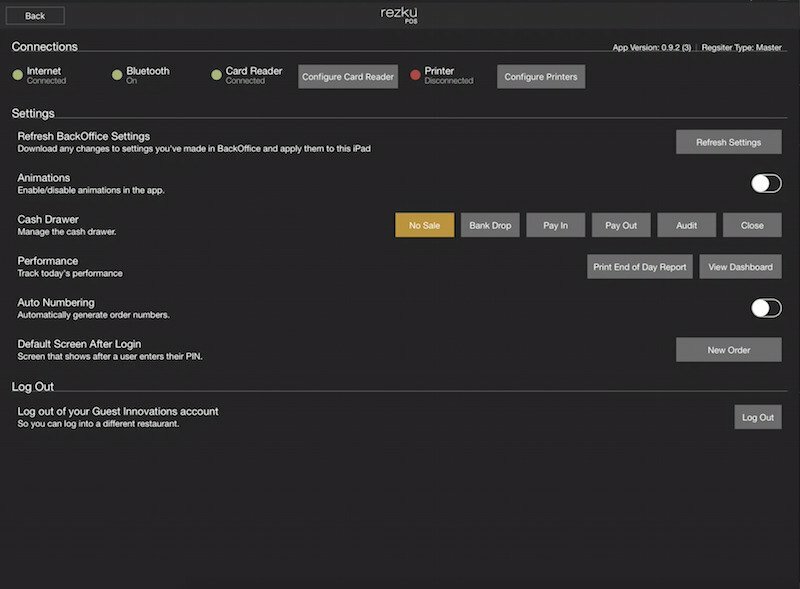 Logging out of the Rezku POS app is different than logging out a user from the register. If you log out here, you’ll need to go through the initial setup steps again. Rezku POS will give you a warning before logging out. If you tap the Log Out button, it will remove your Guest Innovations account from the iPad.